According to many factors, it appears Shrikant Sharma is going to take position of UP Upcoming CM. The son of Mathura, Shrikant Sharma from BJP is not much popular name in national politics. Shrikant is truly a 46 year old mastermind who led BJP victory in the most crucial elections of India. 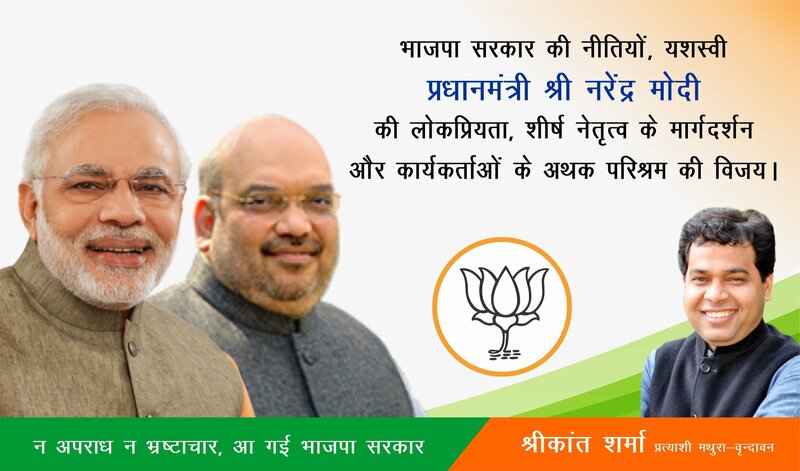 After repeated downfalls on central and state level, BJP got big relief after winning majority in Uttar Pradesh. Shrikant Sharma is upper middle class politician from Mathura. He is not much rich in comparison to many other past CM candidates of the state. Owing only one car Toyota Innova, he doesn’t have a big chamber of cars to roam around the country. Primary family business of Shrikant and his wife is Business consulting and social work. The main source of Income relies on the same. Shrikant is currently holding the position of National Secretary, BJP India. Being one of the most active politician on the social media. He was very much sure about landslide victory of Bharatiya Janata Party in the state during 2017 elections. The candidate was given the responsibility of handling state of affairs and media relations during the elections 2017 by BJP. Mathura Vrindavan holds important role in Indian politics being one of the most important state for Hindus and Followers of Lord Krishna around the world. Going through the profiles of other Ministers, Shrikant Sharma could be the face of developing Uttar Pradesh around the country. After graduating from Delhi University in 1993, Shrikant continues his efforts towards social works. Currently he is one of the key candidate for UP Upcoming CM who can improve the image of state worldwide. The other eligible names include Amit Shah, Smriti Irani and Yogi Adityanath.